Why do some plants like fungi around their roots while others like bacteria? The answer takes us into the realm of chemistry...hang in there. Most soil bacteria secrete a slime that holds them to soil particles so that the tiny microorganisms don't wash away. This slime tends to be alkaline, so as bacteria build up, the soil pH rises above 7. Meanwhile, the type of nitrogen in the soil changes. 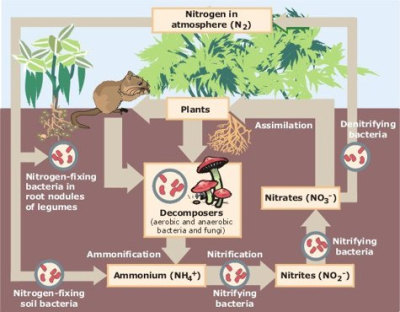 Decomposers in the soil excrete ammonium as a waste product, but when there are lots of bacteria around, the bacteria convert the ammonium into nitrate. On the other hand, soil fungi secrete acids that they use to break down organic matter, making it easier to digest. The acids in the soil make the environment more difficult for bacteria to inhabit, so most of the nitrogen in the soil stays as ammonium rather than being converted to nitrate. As every gardener knows, plants care about pH. What many gardeners don't realize is that plants also care about the form of nitrogen they take up. Vegetables, annuals, and grasses tend to prefer nitrate, while trees, shrubs, and perennials prefer ammonium. Now we know why lettuce is going to throw a hissy fit if the soil is full of fungi. This month is a great time to stock up on homemade chicken waterer kits. A fun project for a snowy night!